We are a leading Exporter of kalonji seeds from Mumbai, India. We are the Leading Manufacturer, Supplier & Exporter of Kalonji seeds. 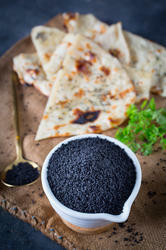 Kalonji seeds are the small black granules found in the fruits of Nigella sativa plant which is an annual herbaceous plant which belongs to the Ranunculaceae family. This is native plant of south west Asia that is abundantly cultivated in India, Bangladesh, Turkey and other Eastern countries.